Our premium CBD Capsules feature a potent dose of wellness benefits in an easy-to-take, digestible form. Hemp Extract, or CBD, is known for its natural therapeutic benefits, which may include anxiety relief, pain treatment, inflammation reduction and promotion of natural sleep. Our capsules are available in different quantities and potency levels, so you can choose the product that is right for your health goals. We proudly source our CBD from organic, superior quality Hemp, and we verify the purity and potency of all our products with a third-party lab. 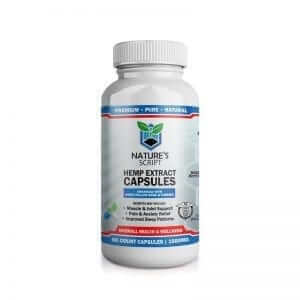 We recommend taking our Hemp Capsules once or twice daily for optimal results. What is CBD? CBD stands for Cannabidiol, and it is a natural compound extracted from both Hemp and Marijuana plants. 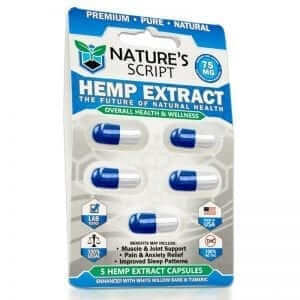 Nature's Script Hemp Capsules contain Hemp-derived CBD and no THC, making it federally legal. Our products won't get you "high" or cause a failed drug test. Instead, they can provide wellness benefits like pain relief, inflammation reduction, better sleep and less anxiety. CBD Capsules are a great way to take the compound, as they're portable and long-lasting. Take a capsule before bed to relax or try one at the beginning of the day to ease chronic pain. Your options are truly endless when you choose Nature's Script.